The Latest Interest Rate Increase Will Boost Bank of America's Net Interest Income by How Much? Bank of America’s chief financial officer just disclosed how much its net interest income should increase following the March rate hike. Bank of America (NYSE:BAC) is one of the most asset-sensitive banks in its peer group, meaning that its revenue is lashed especially closely to changes in interest rates. This situation has weighed on its performance for much of the past few years, but things are starting to turn in the North Carolina-based bank's favor. Since December 2015, the Federal Reserve has increased the fed funds rate three times, for a total of 75 basis points, or 0.75%. The second increase, which occurred in the final month of last year, boosted Bank of America's net interest income by just under $600 million a quarter, which is exactly what the bank had promised. This was one of the two principal reasons Bank of America's earnings surged 44% in the first quarter compared with the year-ago period. The other reason being a sharp year-over-year gain in the amount of money its trading and investment banking operations generated. The good news for shareholders is that there's still more gas in the tank insofar as interest rates are concerned. Rates remain abnormally low. 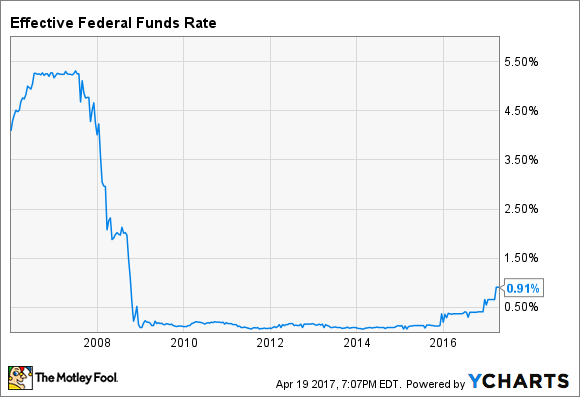 The fed funds rate, which is the primary short-term interest rate benchmark in the United States, has stayed below 1% since the start of 2009. To reach its long-run average, it'll take 20 or so more increases like the one in December 2016. Bank of America's shareholders won't have to wait long to see another uptick in net interest income from higher rates. The Fed's decision to raise rates last month would have had a nominal impact on its first-quarter earnings, but it should shine through in the second quarter. To this end, Bank of America estimates that the latest interest-rate increase will translate into an additional $150 million in net interest income a quarter going forward. Holding all else equal, that equates to $600 million on an annual basis, or roughly $0.06 per share in pre-tax earnings. As of 3/31, an instantaneous 100 basis point parallel increase in rates is estimated to increase [net interest income] by $3.3 billion over the subsequent 12 months, which is consistent with our position at year end. Nearly three-quarters or $2.5 billion of this modeling is driven by our sensitivity to short-end rates. Given a one-month LIBOR rise of about 25 basis points with the March hike and the long end down, we should focus on the $2.5 billion short-end benefit. Dividing that by 4 gets you a quarterly run rate of roughly $600 million for a 100-basis-point shock. Assuming it's only 25 basis points instead of 100 would get you to approximately $150 million benefit in the quarter. In sum, so long as interest rates continue heading higher, Bank of America can look forward to steadily expanding top and bottom lines. This doesn't necessarily mean its stock a buy right now, as valuations in the industry have gotten ahead of fundamentals over the past few months. But it does mean existing shareholders have plenty to look forward to.